Monthly Giveaway Enter for a Chance to Win! 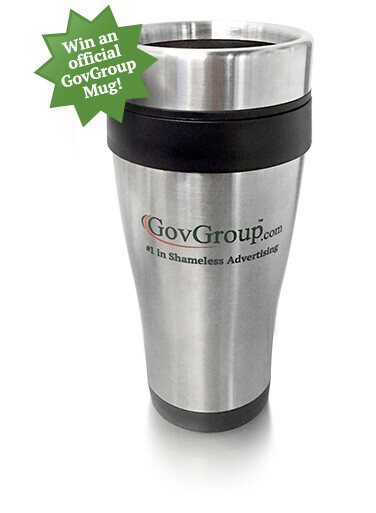 Join GovGroup for an opportunity to win a stainless steel coffee mug. If you placed an order, you are automatically entered to win, however no purchase is necessary to win. A mug is given out at the end of every month. Please note that no purchase is necessary to win nor will a purchase improve chances of winning. Winners will be announced on our website (using first name, last initial, city, and state) and notified on the first Monday following the end of the month. Winners will be chosen at random from all entries from the previous month. Please note that multiple entries or orders will not increase chances of winning. Only one entry per address will be considered. *Offer only valid for entries within the continental U.S.
*Actual coffee mug may be different from the image shown.